This is the largest man-made marine habitat in the world (approximately 8 million gallons). 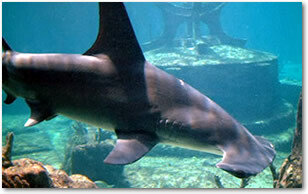 More than 50,000 marine animals, comprising over 150 species, call Atlantis home. The majority of these marine animals are indigenous to Bahama waters (some, like the piranhas, are not) and they live in a sophisticated ecosystem with their well-being diligently monitored by the Atlantis staff. 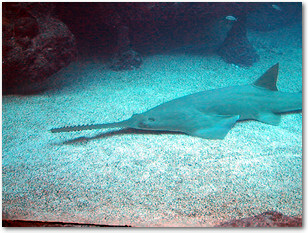 Sharks, sawfish, turtles, stingrays, barracudas, eels, groupers, piranhas, jellyfish, skates. The exhibit includes lagoons (some filled entirely with predators), waterfalls, underground grottos, a rope suspension bridge, and a 90 ft underwater glass viewing tunnel. The entire exhibit is dramatically lighted for evening viewing, and many areas are viewable from within the various restaurants, lounges, and main areas of the resort. 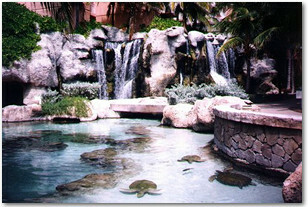 Guests have the opportunity to participate in the daily feeding of the various fish and predators at the lagoons. The resort includes what's billed as the Caribbean's biggest casino, set in a 100,000-square-foot gaming, dining and entertainment area. There is, simply, nothing like it in the world. 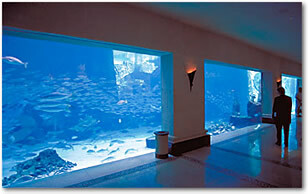 The Entertainment Complex at Atlantis is the hub of gaming, dining, dancing and exclusive shopping. The Complex uses natural light, bringing the outdoors inside via skylights and panoramic oversized windows with panoramic ocean and marina views. Surrounding the casino in the Entertainment Complex are several outstanding dining and entertainment options. Atlantis offers a remarkable selection of restaurants, clubs, and lounges, providing you with a diverse variety of dining and entertainment experiences. No matter what culinary pleasures you desire, your palate will be tantalized by fresh, succulent seafood, American and continental fare, exotic Pacific Rim and Asian cuisine, traditional Italian dishes and more. From poolside casual to upscale elegance, Atlantis has something for everyone. Advanced dinner reservations are required for some restaurants. If your dinner dining times are flexible, you may wish to consider making reservations for dinner between 6:00 and 7:00 pm, or after 9:00 pm, when reservations tend to be more readily available. »Bahamian Club- The Bahamian Club offers succulent steaks and fresh seafood in a country club atmosphere richly decorated in hardwoods. Music and overstuffed chairs encourage diners to linger over coffees and desserts. Evening resort wear required, reservations suggested. Open for dinner only. »The Cave Grill- Serving hamburgers, hot dogs, chicken sandwiches and other quick bites, including ice cream treats. Open for lunch only. »Lagoon Bar and Grill- This spectacular restaurant serves light lunches and drinks daily amidst all the beauty of the Atlantis waterscape. Dine on the terrace under the legendary aquatic painted dome ceiling of the Lagoon Bar and enjoy salads, sandwiches and pizza for lunch. 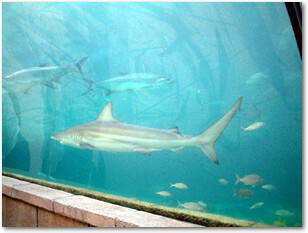 Guests can access the Lagoon Bar via an underwater viewing tunnel through the Predator Lagoon (Open April - August). »The Marketplace- International buffet featuring seafood and Caribbean specialities. Serving breakfast, lunch, and dinner. 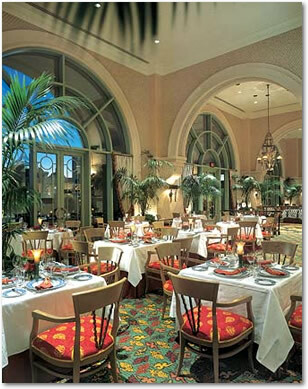 This is the main restaurant at the Royal Towers, it offers extensive buffets for breakfast and dinner. Breakfast choices run from individually prepared omelettes to waffles and pancakes, even mussels, shrimp and small breakfast pizzas. »The Cafe at the Great Hall of Waters- This restaurant offer views into "The ruins of Atlantis"
»Fathoms- Showcasing the freshest seafood from the Caribbean and Atlantic. Open for dinner only. »Five Twins- With a huge 20-foot iron entry gate, stone floors, mosaics and arched windows, the Five Twins restaurant also offers a cigar bar, sushi bar, champagne cart and dance floor. An upscale establishment with its own Japanese chef serving Pacific Rim fusion cuisine. The menu is an upmarket fusion of Asian and Caribbean food and overlooks the marina. Located in the Entertainment ComplexReservations suggested. Open for dinner only. »Murray's Delicatessen- A New-York-Style restaturant and deli serving typical deli food. The 1950's art deco décor of this traditional deli sets the mood for a delicious meal featuring oversized New York-style sandwiches, homemade soups, bagels, smoked fish, and other favorites. Serving breakfast, lunch, dinner and late night. Takeout available. Located at the Marina Waterfront. »Voyagers- Serving pastries, New-York-Style bagels, cakes and chocolates with gourmet coffees. Open for breakfast, lunch, and dinner. »Dive In- Poolside American fast food restaurant serving burgers, chicken, salads, sandwiches and soft drinks. The restaurant is set in water, so you never even leave the pool!Open for lunch only. »Jimmies- Ice cream parlor serving up cool refreshing treats for kids of all ages. Located at the marina waterfront. Open afternoon through evening. »Seagrapes Restaurant- Guests will delight in sampling a delicious buffet featuring Calypso, Cajun and Caribbean foods. Scenic views of the waterscape compliment colorful buffet stations featuring a lavish breakfast buffet, brick oven pizza, a salad bar with the freshest ingredients, made-to-order food stations, carving stations and topped off with irresistible desserts. Open for breakfast, lunch, and dinner. »Villa d'Este- Italian trattoria, featuring gourmet Italian cuisine. Featuring the island's best Italian cuisine. The sophisticated menu includes homemade soups, fresh salads, a variety of pasta dishes, and other favorites. Top dinner off with a Tiramisu and a cappuccino and you'll think you are in Little Italy. Evening resort wear required. Reservations suggested. serving dinner..
»Water's Edge- International buffet. Overlooking a lagoon teeming with sharks and rays, Water's Edge features a traditional American buffet breakfast in the morning. Dinners start with a visit to the elaborate antipasto display, followed by oversized, family-style Italian dishes.Reservations and proper attire are suggested. Serving breakfast and dinner. »Mama Loo's- Features Oriental food. Traditional Chinese dishes are accentuated with a Caribbean flavor. An exotic drink menu provides the perfect start to any dining experience. Evening resort wear required. Reservations suggested. Serving dinner only. »Atlas Grill and Bar (just off the casino floor)- The restaurant is shaped like a Roman chariot track with a bar in its center and diners are surrounded by dozens of television monitors beaming news, sports, music or movies. Features American favorites like over stuffed sandwiches, burgers and more. Open for lunch, dinner, and late night snacks. 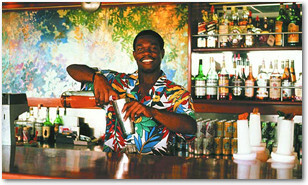 »Pointe Restaurant- Serving light meals and cocktails outside at the marina. »Coral Towers Lobby Lounge- Enjoy fresh baked goods in the morning, and cocktails, coffee and mixed drinks throughout the day and night in this comfortable and inviting atmosphere. Resort attire in the evenings. Restaurant hours and openings may vary at any time. Guests should check with Guest Services or Restaurant Reservations for a current list of hours and openings. The hotel has strict dinner reservation cancellation policies. Cancellations must be made at least 24 hours prior to reservation time or cancellation fees will be assessed. »Dragons- Lounge and dance club, with a video wall featuring live entertainment. Dance the night away to live music provided by The Bahamas' hottest house bands. »Plato's- Lounge, offering panoramic views of virtually the entire resort. »The Baccarat Bar/Lounge- A sophisticated vantage point from which high limit guests are able to keep there eye on the casino action, right next to the blackjack tables! This luxuriously appointed lounge caters to high-limit Casino guests. Champagne, caviar and chilled seafood are served with exquisite care along with a full service bar. Resort evening attire. Located in the Casino. Bars are also located in the Atlas Grill and Bar, Five Twins, Fathoms, Voyagers, Murray's Delicatessen, Coral Towers Lounge and Tower Lobby. Pool Attire is acceptable for outside dining, i.e. bathing suits and similar apparel. Resort Casual Attire is requested throughout the day at all inside resturants, i.e. T-shirts or polo shirts, dress shorts, slacks or jeans, skirts or sundresses, bathing suit cover ups and shoes. In the evening, Resort Casual, is acceptable at many of our resturants. Smart Casual Attire is required for our fine dining resturants featured in the Gourmet Meal Plan, i.e. button-down shirts, slacks, evening dresses and skirts or similar apparel. Jackets are optional. No shorts, jeans, polo shirts or t-shirts please. Atlantis offers a diverse selection of dining experience. 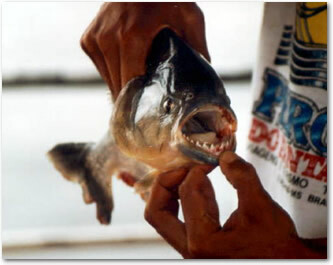 Enjoy the freshest seafood. American and Continental favorites, exotic Asian and Chinese cuisine, traditional Italian fare, bountiful marketplace buffets, and authentic Bahamian dishes. The Atlantis dining plans provide great options to enjoy a variety of these restaurants and culinary experiences. Dining Plans are available to Atlantis Guests only and must be purchased prior to arrival. »Gourmet dining ($75 per adult, per day). 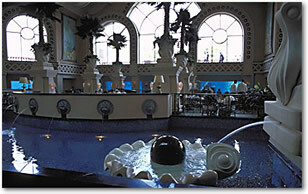 »Atlantis Full American ($55), which features a choice of dining experiences. Mandara Spa is the most modern luxury spa in the Bahamas. A full-service spa the Mandara, is an 11,500-square foot luxury spa with a broad range of pampering treatments by Mandara, one of the premier luxury spa management companies in the world. They have dedicated themselves to providing an intimate environment for achieving ultimate results. Among the treatments offered are a variety of massages, facials, body treatments, aromatherapy treatments and salon services. In all of their spas, Mandara uses the highest quality natural ingredients and treatments especially selected to elevate the experience to the truly unique. The spa offers a temple for regeneration, revitalization and renewal. It also features 14 lavish treatment suites for both private and couples use, state-of-the-art Alpha Capsule and the luxurious open-air heated Thalassotherapy pool. Mandara Spa is only available to registered guests of the Hotel. You'll also find at Atlantis an upscale retail shopping complex featuring designers such as Lalique, Ferragamo, Cartier, Façonnable, Gucci and Bulgari as well as exclusive items designed for Atlantis by Nicole Miller. 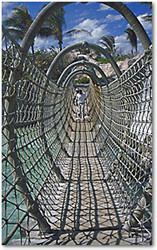 The Atlantis Library consists of a vast collection, ranging on every subject. 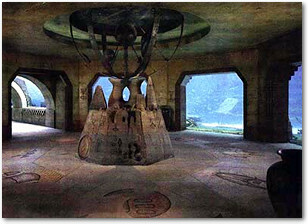 It is located in the Reef Wing and is arranged on two floors. There is no charge for the use of the library and it's contents. Guests checking out books, who do not return them, have a charge will be placed on their room account.